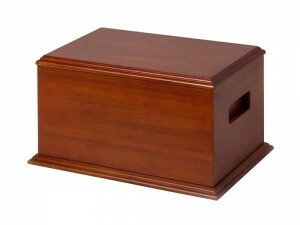 The Goodwood horse ashes casket – a beautifully crafted casket in solid environmentally-friendly bamboo wood with an attractive mahogany finish. The timeless lines of this quality casket are enhanced by discreet inset handles with no external fixings. The Goodwood casket is available in three sizes suitable for small horses and ponies up to the largest horse or other large companion animal.